7th Rangers: Who de f**k is Anwar Ibrahim? An unelected nobody !!! 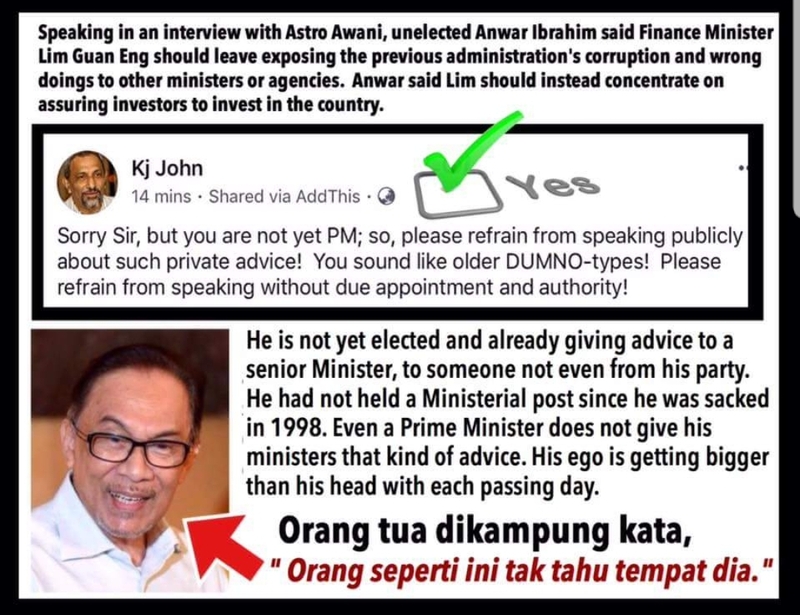 Who de f**k is Anwar Ibrahim? An unelected nobody !!! 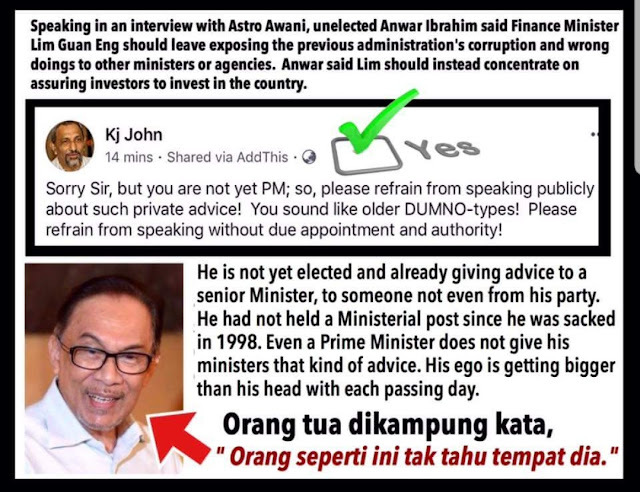 Anwar's arrogance is astounding. He has no role in government but yet sees it fit to 'expose' his unsolicited advice to Guan Eng to the world media! Undermining the nation's finance minister in this way is more likely to affect the Market's confidence in Malaysia than Guan Eng being honest about the nation's finances. Anwar must be advised that the Rakyat is increasing seeing him as a liability than as Prime Ministerial material. His underhand machinations, disloyalty and disrespect for Mahathir's choice of Guan Eng as finance minister does not augur well for his assumption that he will automatically succeed Mahathir as PM. As things stand , Azmin is increasingly looking like the favourite candidate. Why should DAP and Bersatu support Anwar as future PM if he is undermining them? A PM must have the support of the majority of MPs. If Azmin can be friendly with all Pakatan Harapan component parties and not play the race and racial card, his position as the next PM of Malaysia is assured. Totally disagree with you, Anwar. Lim cannot pacify investors without gaining investors confidence. Lim is heading in the right direction while you, should learn the International expected transparency standard. Malaysia has been viewed as a corrupt country since your days as DPM. The market has long been anticipating that Malaysia will meet the same fate as Argentina a matter of time. If Malaysia wants to regain investor confidence then Lim should continue to tell the truth. Investors of these days are sophisticated and don’t buy window dressings from whatever agency especially when Malaysia have much trust deficit. The financial mess that Malaysia faces now is the legacy of the previous administrations. Face the fact that it will take a long time to clear and do not for a moment think that covering or window dress it will help. Your suggestion if at all holds water is of no merit, just a naive self-deception for a quick fix. You are certainly a true blood of UMNO’ DNA and mentality.One seriously wonders whether you are the right candidate for PM after Dr M. Time has changed; oil will soon be of no value, and that even the Arabs realise it. Well, man can propose but let us see how God will dispose of. Malaysiakini : Finance Minister Lim Guan Eng should leave exposing the previous administration's corruption and wrongdoings to other ministers or agencies, PKR de facto leader Anwar Ibrahim said. Speaking in an interview with Astro Awani, Anwar said Lim should instead concentrate on assuring investors to invest in the country. "I met with and told Lim Guan Eng that the position of the finance minister should be more sensitive. "Every statement (by the finance minister) will reflect directly on investors," Anwar said during the recording of the 'Al' interview programme on the news channel, which is set to be broadcast at 8.15pm on Thursday.